My guest interview is "the grocery shrink;" a lady that has accomplished something that most of us can only dream about. Her name is Angela Coffman and she has an informative website called: groceryshrink.com - that blew me away. I thought if this "wowed" me, then my readers would also learn from this expert on how to save money at the grocery store. Q: Angela, first we want to thank you for taking time out of your busy schedule to talk with us here at Miss Homemade - we really appreciate it. My first question to Miss Grocery Shrink is one that I'm sure all my readers are thinking of right now: In this economy today it is downright difficult (and depressing) to plan a cost effective homemade meal - that is also nutritious and tasty without splurging at the market on groceries to prepare it. For the readers who have not heard of you (yet), How did you do it? Please give us a quick recap of your story, and how you became the Grocery Shrink. A: Thank you for your kinds words. I'm blushing! I became the Grocery Shrink out of necessity. Five years ago, we had 3 little kids, very little money and a lot of debt (About $87,000). After hearing a Christian financial counselor on his radio talk show, we decided things needed to change. We got on a budget and I had a blast making what little money we had stretch. We were able to free up a lot of our money each month to pay down our debt. It helped too that the radio show we heard was having a contest. The 10 families that paid off the most debt or saved the most money as a percentage of their income in 6 months won a trip to the Bahamas with the show host. I wanted that trip and was willing to do anything moral and legal to win. And we did! We cut our grocery bill to $185 a month, switched to cloth diapers, cloth toilet paper and cloth paper towels. We turned off our heat. Darren chopped wood and I hauled it and kept our fireplace running. I sewed the kids clothes out of recut adult clothes that were cast off by our neighbors and Darren and I made do with the clothes we had. We ate nutritious weeds out of our yard and worked on a nearby family farm for fresh produce and beef. We won the trip and in the Bahamas the show host told me I needed to start a home based business teaching other women to live like we did. That's how the Grocery Shrink was born. Q: Miss "Grocery Shrink" - We are also curious about the budget guidelines that you talk about on your website..... Can you give us some basic guidelines (not to give away information on your e-book) on how to create a budget that is "user friendly?" A: Sure! First of all, budget every dime you bring home, monthly. Even if the money will be blown or saved, agree to it as a couple (if you are married) on paper first. For food, I recommend $50 per person per month. 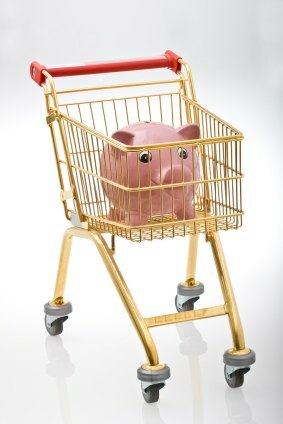 At the Grocery Shrink I teach you how to stick to a budget like that. For the last 6 months, my family has been eating for $29 per person per month, so I believe most anyone can do $50. Food is the biggest money waster in America. The great news is that getting a handle on that area of the budget will free up cash to help you reach your goals. Once you've agreed on paper to what you are going to spend your money on, take out that money in cash (except for gas and other bills you will pay online or with a check.) Never use a credit card again, and save your debit card for paying at the pump. Cash hurts worse than plastic and you will spend less automatically. Most people spend 20% less just by banning the plastic. Put your cash in envelopes labeled with the category it's for. I have categories for food, clothing, gifts, household misc, blow money, school supplies, and vitamins/medicine. You can make whatever categories you want. Then promise yourself two things: 1. You will only spend the money in the envelope for things that fit in that category (unless you agree as a couple to move it.) and 2. When the money is gone, you are done spending until next month. It is best to make a brand new budget every month. Some of the items will stay the same, but you should reevaluate how the budget worked for you last month and how you can make it better. Q: I see that you have available for purchase on your website: "Huck Towels." How are they used and how much money have you saved using them? A: Huck towels are absorbent, washable, cotton towels made for hospitals - to use during surgery. I use them at home instead of paper towels. I grab a huck towel for washing windows, cleaning up spills and generally anything I used to use a paper towel for. There are still times a paper towel is better--like for grease. I buy an 8 pack of paper towels once a year for draining bacon and wiping out my cast iron pans. I used to use an 8 pack of paper towels each month! I've used my Huck Towels for 6 years and have saved about $120 a year or $720 since we started. It's definitely worth it to wash them and Huck towels work better and faster than paper on spills. Q: Your children are beautiful and I enjoyed your blog and the pictures very much. How can homemakers benefit from your blog? What I mean is you have very clever ideas to save money.... What inspires you? (I know know why they call her the "grocery shrink." A: Thank you! I'm partial to my kids and they are my inspiration. I am motivated to live a frugal life to protect my ability to be home with them full time. There are also a lot of things I'd like to give them. Material things come and go and have no lasting value. But I can give them myself, faith, home skills, life skills, business skills, healthy food, and great family memories. A lot of people ask me how I have time to blog with the five children, homeschooling, and my 3 businesses. I just blog about what we were going to do anyway and pull out the camera to document it. The best thing about it, is that they are real and doable activities, recipes, and money saving strategies that I'm implementing in my home. Q: My final question: The reason I loved your blog is something I whole heartily believe in: Life IS about home and family - two very important elements that I believe are dwindling away as we speak.....spending time with family is priceless, and saving money in the meantime is HUGE. Any thoughts on this? A: I agree with you totally. The best part is, saving money can create more valuable family time. It's easy to pay for entertainment, clothes, and ready made food (and it's okay to do it when you can afford it,) but when we shut off our TV and started doing these things for ourselves as a family, we saved money and created memories at the same time. Playing a game for entertainment really does build a closer relationship (and a stronger character) than going to the movies or watching cable. It's also helping to build my character as a person. I no longer look for the easy way to do something, but try to strike a balance between, frugal and healthy without creating stress. There's no room for lazy bones at my house, but we sure enjoy a well deserved rest when we get one. I'm also growing in the area of letting my kids "help." Most moms have figured out that it's easier to do the job ourselves, but it sure is rewarding now to watch my 9 year old sew, cook and clean without much help from me. She learned those skills by helping. She is also dreaming of the business she will start so she can be an at home mommy. We are far from perfect at my house, but I love my life! Q: Angela, is there anything else you would like our readers to know? A: If you are new to homemaking or frugal living, all of this can seem overwhelming. Start small, one step at a time. Each new thing you try is a step in the right direction and a great example for your children. You can start shaving your food bill by taking a blank calendar and writing your supper meals on each day for the month. I use old food magazines and cookbooks to help inspire me. Then when running my regular shopping trips I stock up on the foods that are rock bottom prices. By doing this I've built a pantry of 3-6 months worth of food for my family, and I started making my menu based on what I had on hand instead of what I was going to go buy. My pantry saves me time by allowing me to shop once or twice a month instead of every week (or every day). It is also a great cushion against sudden loss of income. My husband was recently out of work for 6 months. We qualified for food stamps at a whopping $750 a month, but didn't accept them. We had a pantry and great shopping skills that allowed us to eat for $200 a month. For a family of 7-- that's pretty good! I think its a fun game to have little food in the fridge and see what I can make with can of this and a pinch of that from my pantry shelves. Give yourself freedom to experiment. The worse thing that can happen, is that it doesn't taste good. And more likely it will taste great and win you a prize in a recipe contest. "The Grocery Shrink." She's a wonderful gal and I thank her for allowing me to interview her.